How to Duplicate an Existing Person or Object in Photo? Home > Photo Editing Tips > How to Clone Yourself and Other Objects in a Picture Without Photoshop? How to Clone Yourself and Other Objects in a Picture Without Photoshop? Photography is one of the most loved activities in the world. People love capturing special moments, and clicking pictures of themselves as well as their loved ones. Some people even pursue it as their full-time career and make a name for themselves. Though for most people photography simply means taking photographs using either their dedicated cameras or their smartphones, many photographers like to tinker around, with the images they capture, in fun and unique ways. Cloning existing objects in a photo is one such editing activity that many photographers love to experiment with. They duplicate existing objects in the photos, to create their replicas in the same photo, and create unique style images. If you too tinker around with photos like this, or are interested to try it out after reading about it, then this article will surely help you. In this post, we will tell you about a powerful image editing tool that allows you to clone yourself or other objects in a photo in fun ways to create unique results. Jihosoft Photo Eraser is a very powerful photo editing tool that allows you to achieve object cloning in images very easily. You don’t need to be be a professional to operate this software to create such eye-catching images. It is very simple and easy to use as we show in the below steps. Before we dive deeper into how one can use this software to duplicate a person/an object in a picture, let’s first take a look at the UI of this software. Understanding the layout of the software will help us use it much easily and confidently in future. As can be seen from the image above, the software has simple and minimalistic layout with all the tools neatly arranged on the left toolbar. All the tools can be easily understood according to the vivid icons. You can find more details about every tools in this Jihosoft Photo Eraser User Guide. The central pane is where the editing process an image takes place on. There are 2 buttons in the central part. One allows users to import a single photo, whereas the second allows you to import a folder full of photos for bulk editing. By the way, you can use the Add Photos button at the bottom right corner to add one or several photos at any time even when you are editing photos. All the imported images are shown as thumbnails in the rightmost pane. The one which is selected shows up in full view in the central pane. How to Copy Existing Objects in a Photo? Since we have understood the layout of the application, now lets try and understand how we can copy an object in a photo. The process is very simple. Just follow the steps mentioned below. Step 1: Import the image, to be edited, into the application. As we mentioned before, use the button present in the central pane to do so. Step 2: Now Select the Selection Brush Tool first from the left toolbar. Now the pointer will turn into a red solid circle, and you just simply need to brush over the object to specify what you need to clone. 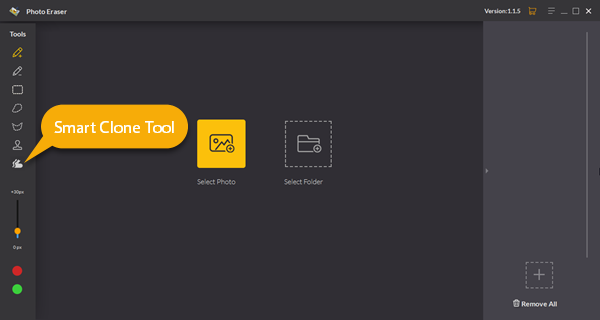 Step 3: Then select the Smart Clone Tool from the left toolbar. Once the cloning tool has been selected, you can drag and drop the object that you want to duplicate to any area of the photo. You can repeatedly perform the “drag and drop” action to fine tune the position of the duplicated object. Step 4: After you find the right place to put the duplicated object, click the Erase button in the lower right. Then the program will smartly analyse the area to be cloned, and replicate its pixels to the new area creating another instance of the cloned object. 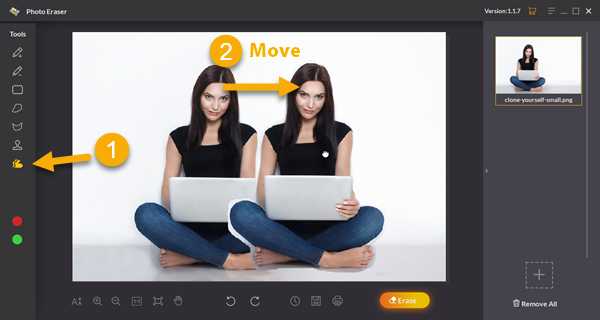 So as you can see from the above steps, cloning an object in a photo with Jihosoft Photo Eraser is extremely easy and anyone can do it with no real photo-editing skills required at all. Just import, mark the area and clone the object. Using the power of this easy to use software, you can create unique and fun images as above. Apart from the cloning of object in photos, as explained above, there are many other amazing features that this application offers to its users. The application allows its users to repair damaged buildings and objects in photos. The application provides a feature to remove unwanted objects like persons, watermarks, logos, emojis, stickers and other stuffs from photos. It also allows the users to reduce the wrinkles and skin blemishes on photos of themselves and their friends & family. It can be used to do restoration of old photos by removing the scratches of the old images. Jihosoft Photo Eraser is a powerful photo editing tool that provides its users many amazing features. And the best part about it that unlike many other similar softwares, is that there is no complex learning curve for using this software. It is very easy to operate and in a few tries, anyone can start utilizing its powerful capabilities to produce exciting and amazing photographs. The application is available for Windows operating systems now so the majority of the users are covered. It is also not heavy on resources and can run on even budget laptops and desktops. The application costs only a one time fee for the lifetime license and updates for that price. For all the features and lifetime license, the fee is pretty minimal. You won’t be disappointed with your purchase. And if you still aren’t convinced, there is a trial version available, which you can use to try out all the features without limitation before you think about buying.